In 2015, a woman was killed and eight others were injured when a Chicago Transit Authority bus jumped a curb during rush hour on Chicago’s busy Michigan Avenue, creating a horrific scene of chaos and carnage when the dead woman was pinned beneath the bus. Not only was the incident life-altering for those injured, but witnesses and bystanders were also traumatized when they ran to assist the woman, only to discover that she was already dead. According to estimates, there is one crash every 36 minutes involving a CTA bus, and in 2014 alone, almost 500 people were injured in those crashes. Still, those numbers are low compared to general traffic accidents, according to a CTA representative. The CTA is the second largest public transportation system in the nation, and on an average weekday, it accommodates approximately 1.64 million riders. Most of the crashes that do occur are caused not by CTA drivers, but by other drivers instead, the CTA says. “We have a lot of incidents in which vehicles rear-end buses, turn in front of buses, sideswipe them, so only a small percentage is really the result of actions by CTA bus drivers,” said Steele. For example, a 2017 accident that left four dead and twice as many injured occurred when a car hit a CTA bus head-on after losing control while speeding, hitting first a parked car, then the bus. All four of those killed were in the car, authorities said. Bus accidents can occur for a wide range of reasons. Drivers become ill and lose consciousness, drivers spend too much time on the road and become a road hazard, other drivers fail to understand that buses have blind spots and may not see them from certain angles, buses will swerve to avoid deer or other road hazards. Driver fatigue. Although drivers operate under strict regulations that govern the number of hours a driver can spend either driving or on duty, this particular safety regulation is often ignored. Driving longer hours puts drivers at risk of falling asleep behind the wheel or having slow reaction times that can make accidents less difficult to avoid. Driver distraction. Either someone on the bus or something outside of the bus causes the driver to take his or her attention off the road, or the driver is creating his or her own distraction by using a cell phone or texting. Either is dangerous, but one is deliberate. Road conditions. Any vehicle is difficult to control on snow or ice, but buses, which have a different center of gravity than other vehicles, are even more dangerous in inclement weather because they are so much more difficult to handle. Safety violations. Some buses on the road are unsafe, either due to undiagnosed mechanical problems, neglected safety checks or repairs that have been put off in order to save money. While cutting corners is unlikely in a CTA bus, it would be possible for a mechanic to miss a problem or misdiagnose one. Inadequate maintenance. A careless maintenance worker can over- or under-inflate tires, triggering blowouts that can cause the bus and other vehicles to crash. Heavy traffic. Accidents are more likely to occur in an urban setting, where traffic can be heavy and drivers can be reckless, making Chicago riskier for not just bus accidents, but traffic accidents overall. Aggressive driving. Bus drivers are as likely as other drivers to drive too fast and a bit too recklessly, especially if they are on a tight schedule that has been slowed by weather, traffic or road construction delays. Drug and alcohol abuse. Commercial bus drivers face drug and alcohol testing, but random testing should be conducted on a regular basis to help prevent accidents. In 2014, a CTA shuttle bus slammed into a concrete barrier near Chicago’s busy O’Hare International Airport, sending 15 to the hospital, some with serious injuries. The bus driver, who was later cited for failing to produce a drivers’ license and failure to stay in the appropriate lane, was pinned in the crash and rescued by a firefighter who was on his way to work and was just two cars behind the bus when it crashed. 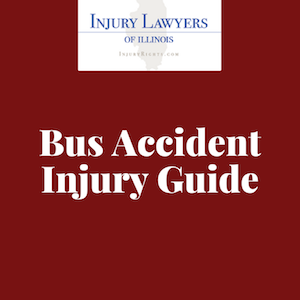 If you have been injured in a bus accident, especially so a Chicago Transit Authority bus, you will need an experienced attorney who will be able to fight the team of lawyers CTA and other large companies put in place in an effort to intimidate claimants into keeping claims low. Fortunately for passengers, however, buses can offer evidence after a crash. CTA buses usually carry black boxes that record speed and other valuable data in case of a crash. A good attorney will know to acquire the information on that box before it is destroyed. That said, because evidence like black box data can be easily lost, it’s important to act quickly if you are injured in a bus accident and believe that the bus driver was at fault in order to preserve that evidence and bolster your case. If you were in a bus accident, call us today. You won’t pay a thing unless we win your case, and your consultation is completely free.